Secure your spot!- Register HERE! Chilled Ponds will be offering Contract Freestyle Ice during the 2018-19 Skating Season. This schedule will run from October 1, 2018-March 31, 2019. 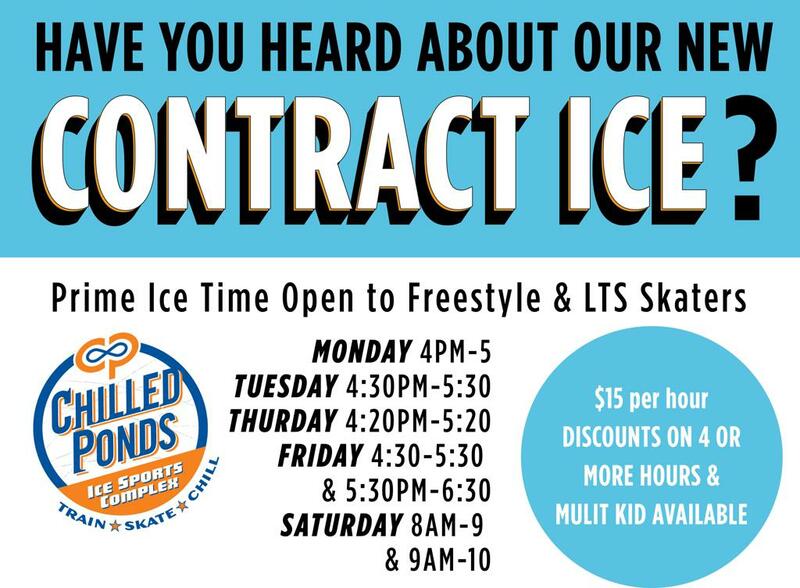 These are more ‘prime time’ hours; and by offering contract freestyle ice, we are guaranteeing these skating times throughout the year. Purchasing Slots: For the safety of each skater, slots are limited to 20 people per contracted hour. This will secure that particular skaters place on the ice. Once a particular time has had all slots filled, skaters will be wait listed and will have the option to choose from any remaining contract ice times. If enrollment for the wait listed time opens, skaters will be notified with the option to reserve. How to Register for Contract Freestyle Ice: The contract period will be in 3-month increments. For example, if you want to skate on Tuesdays from 4:30-5:30pm, you will commit to that time and pay for the 3-month length of the contract. Cost: If purchasing 1-3 Contract Freestyle Ice Sessions per week, the cost is $15 per hour; by purchasing 4 or more Contract Freestyle Ice Sessions per week, the cost will be $13 per hour. For walk-on cost during a Contract Freestyle Ice session please ask a Front Desk associate. Skaters will pay for the 3-month contract period within the week prior to the start of the contract period. If a skater has contracted ice but wishes to walk on an additional Contract Freestyle session, the cost for that session will be the skater’s Contracted Freestyle ice rate. Missing a Contracted Freestyle Ice session: If a skater misses a Contracted Freestyle Ice session due to an illness, competition, school activity, vacation…, a make-up will be granted at the discretion of the Skating Director. Please let the skating director know that a session was missed. If a skater becomes injured and is required to be off the ice for a portion of their contract, a note from a doctor will be required; skaters will receive rink credit on their accounts. Refunds will not be given. Contracted Freestyle Ice schedules for the 3-month contract period will be available at least two weeks prior to the start of the next Contracted Freestyle Ice period. Skaters who are in Learn to Skate classes will only be able to use their 4 public sessions towards public sessions, not towards Contracted Freestyle Ice.